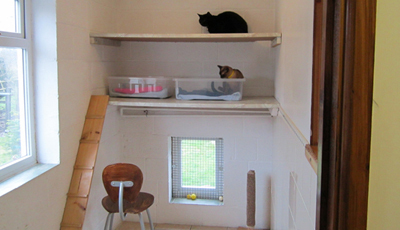 We have taken the up most care to ensure that your cat has a safe and comfortable stay with us. Each pen has a large comfy heated draft free sleeping area as well as a light airy exercise area. Both of which our guests will have access to at all times. We have pens to accommodate one to four cats. Our guests will be fed twice a day on whatever diet is most desired. We do our best to maintain your cats regular eating pattern and diet and so we stock a variety of dried, tinned and fresh foods. Plently of fresh drinking water is always available. If your cat has any special dietry or medical requirements please do not hesitate to inform us and we shall meet any needs. We will take note of your cats veterinary details and have our local vet on call 24 hours a day. We ask that all our guests are fully vaccinated and have a valid and up to date vaccination record with them upon arrival. During their stay with us our guests will be regularly groomed and will recieve plenty of tlc! There will be complimentary toys and scratching post in their exercise area.